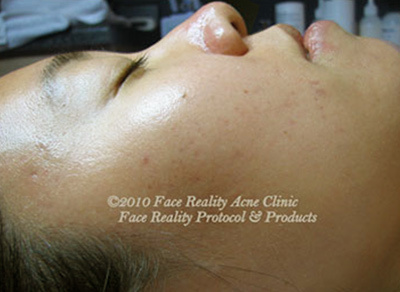 Face Reality Acne Clinic was launched in 2005 by Laura Cooksey, an esthetician in Northern California, who has specialized in treating acne since 1990. She has earned a nationwide reputation for her remarkable results in treating acne; and has been sought after by skin care specialists to teach her methods and share her knowledge. What is a face reality certified specialist? A skin care professional who becomes Face Reality Certified is someone who has studied Laura’s modality and passed a test to indicate their proficiency. Only when they become certified will Face Reality allow someone to sell and professionally use their acne products. The Face Reality Acne Specialist then also has the support from the team at Face Reality Acne Clinic when they come across a particularly difficult or unusual case of acne or similar skin condition. Face Reality has honed its methods and products through helping to clear thousands of acne sufferers of all ages and ethnicities. Although most of these people had already tried prescription topical products, antibiotics, laser and blue light therapy, AccutaneTM and a myriad of over-the- counter products, they had not gotten and stayed clear until they found Face Reality Acne Clinic. Face Reality continues to research, experiment and conduct clinical trials to continually improve their modality and share the information with its Acne Specialists community. *Expect to pay about $150 for your first set of acne products at your first appointment. We do not offer treatments or extractions to clients that do not use our home care products.